Let’s talk about your blog. It’s your shop window. It talks about your company, your products, your clients. It helps potential customers see your company as a reliable, respected partner, so that when they’re ready to buy from you, they come to you first. It helps build your list. Business blogging is tough. It can feel like everyone else is getting huge page view figures and thousands of shares – because they write about parenting, food, other lifestyle topics or – gasp – how to make money online. When you’re trying to get your small business blog off the ground, it can feel like massive traction is always going to be out of reach. I started my small blog about managing projects at work in 2006. Since then, I’ve been invited to speak at international conferences, published several books (via traditional publishers, ebook publishers and self-publishing), and grown my email list to around 18k professionals, all keen to hear about news, tips and insights into my very niche sector. I started supporting other business bloggers in the same situation as me when I couldn’t find a blog conference to go to that spoke to my unique challenges as a business blogger. I didn’t want to learn about the best plugins for recipes, or how to do Facebook live, when most of my readers have Facebook blocked through their corporate firewall. I wanted practical strategies to grow a blog with a professional readership. And I know that others feel the same. Come up with content ideas, even if you think everything you have to say on a blog is a teeny bit boring! Understand what your customers really want. When you know you want to do something better/differently, but you don’t know what, an independent expert opinion can get you on the right track quickly. 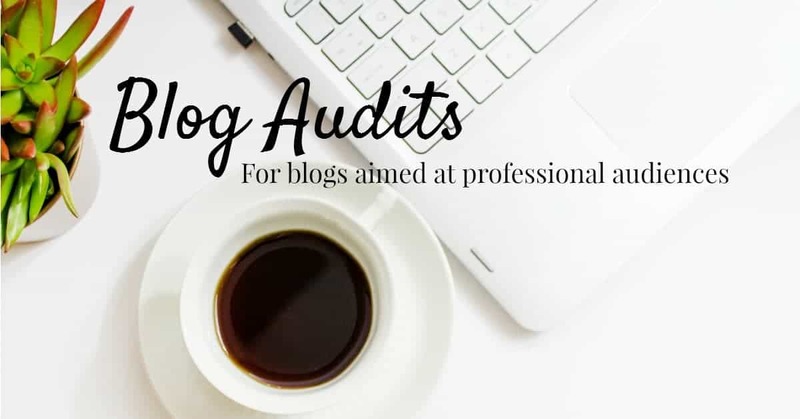 Carry out a full audit of your blog and how it fits into the rest of your website. Provide my findings in a detailed report with a supplementary video walkthrough. Give you actionable tips that you can start implementing now to boost the performance of your blog. Answer your specific content marketing questions (up to 3) and advise on any areas that you flag as being of particular concern for you or your team. I’ll send you a detailed questionnaire before I get started. Then I’ll turnaround your blog audit quickly so you can get to work. Back end audits on WordPress sites only. I require access to your dashboard to review plugins, category set up etc to give you insights into how to run the behind-the-scenes set up more smoothly. Please get in touch for bespoke packages.